"Texas policymakers will have much to consider as they work to keep our surface transportation network supporting healthy economic growth." Texas Comptroller Glenn Hegar points out that Texas has the nation's largest road network but that the state's growth is putting unprecedented strain on the state's highways and farm-to-markets, "causing delays and pushing an aging infrastructure to its limit." address some urgently needed repairs, but the state still faces a considerable challenge in ensuring safe and reliable roadways for a never-ending flow of new Texans. Even keeping our traffic flowing as well as it does today will require a considerable financial commitment," Hegar wrote. 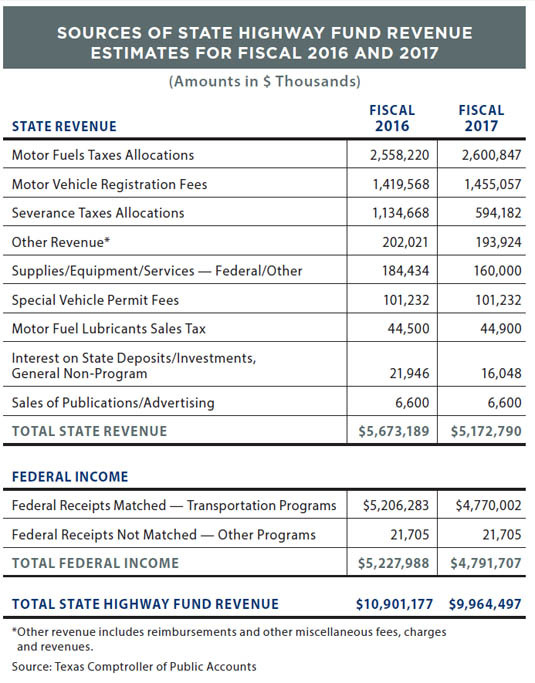 This month Fiscal Notes, a publication of the Comptroller's Office, takes a swing at explaining how the Texas highways are financed and the failure of traditional funding sources to keep up with the significant funding gap Texas leaders have been working to deal with. By 2040, TxDOT projects that motorists will drive 800 million vehicle miles daily, compared to about 455 million miles a day in 2014. Meanwhile, many Texas bridges, roads and highways are showing their age. 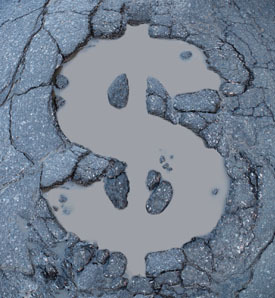 Recent studies show our roads need extensive maintenance and enhanced safety features. The American Society of Civil Engineering considers at least 38 percent of Texas’ major roads to be in poor or fair condition. Texas has about 53,000 bridges, more than any other state. Of these, the Federal Highway Administration rated nearly 19 percent as either “structurally deficient” or “functionally obsolete” in 2015. A bridge is considered structurally deficient if any of its major components are significantly deteriorated. Functionally obsolete bridges no longer meet current highway design standards, often because of narrow lanes, inadequate clearances or poor alignment. Funding for Texas’ State Highway Fund (SHF) — almost $21 billion for the state’s 2016-2017 biennium — comes from several sources, the largest by far being the federal government, which supplies just under half of Texas highway revenue. The state’s motor fuels taxes and auto registration fees account for the bulk of state revenue. In November 2014, 80 percent of Texas voters approved Proposition 1, an amendment to the Texas Constitution directing more funds to transportation. The state’s Economic Stabilization Fund (its “Rainy Day Fund”) receives 75 percent of the state’s oil and gas production tax revenue in excess of fiscal 1987 revenues. Proposition 1 now redirects up to half of this amount for highways, based on the decisions of the committee of legislators that guide the ESF. Another boost for state transportation projects came in November 2015, when voters approved another constitutional amendment, Proposition 7, which could constitute the largest increase in transportation funding in Texas history. Beginning in fiscal 2018, Prop 7 directs the Comptroller’s office to annually deposit to the SHF $2.5 billion of net revenue from the state sales tax, after total sales tax receipts exceed $28 billion. This annual transfer will expire at the end of fiscal 2032 unless a future Legislature extends it. 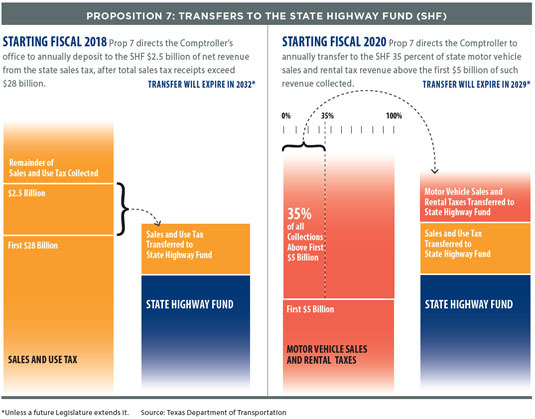 In fiscal 2020, Prop 7 further directs the Comptroller to annually transfer to the SHF 35 percent of state motor vehicle sales tax revenue above the first $5 billion of such revenue collected. In recent testimony before the Senate Finance Committee, Comptroller Glenn Hegar indicated that this provision would generate $375 million in highway revenue in its first year. The motor vehicle sales and rental tax transfer will expire at the end of fiscal 2029, again unless lawmakers choose to extend it.